Here is a look at my Pocket ring month. 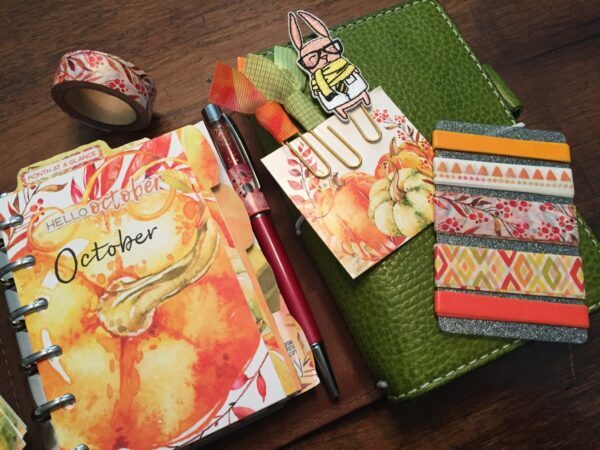 I used the Cocoa Daisy number stickers, washi tape and some decorative stickers on my monthly spread. “Greetings everyone, my name is John. I am a university professor and classical flutist by day and a planner out of necessity. I teach music, flute, and chamber music at the University of Tulsa and Tulsa Community College. I am the Principal Flutist with the Tulsa Symphony Orchestra. We have a classical series, a pop series, a chamber music series, we perform in the pit for Tulsa Ballet, and even with many of the touring Broadway and special shows that make their way to Tulsa. With trying to keep track of all the places I need to be, I had to learn to keep a diary or schedule from the beginning. 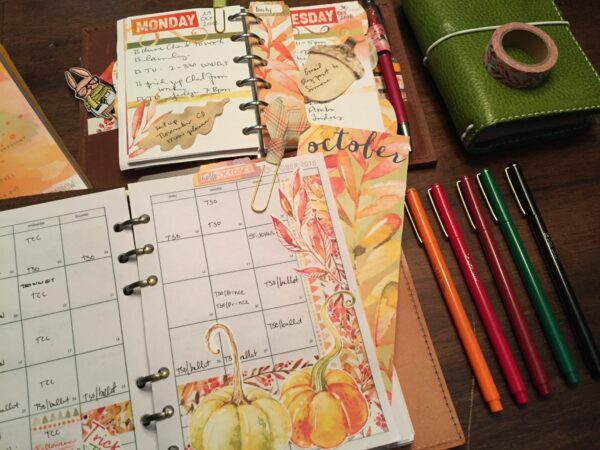 When I first started planning all I used was a Day Runner planner and a pen. Just the small size, the large was just too big. I eventually moved to a Week-At-A-Glance planner from Staples. Due to its thinner profile, it didn’t bulk up my gig bag/music bag too much. When carrying a flute, piccolo, some recorders and much music having a large planner just was not a possibility. Here is my month in my Personal setup. 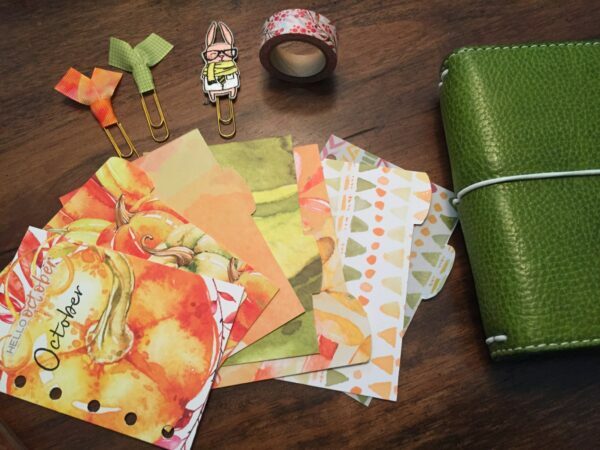 This is a personal wide insert where I used the Cocoa Daisy washi tape and some of the decorative pieces on the digital downloads. I stumbled upon videos about traveler’s notebooks, the Midori in particular during 2013-2014 school year and performing season. The first videos I saw were by Carie Harling. I am sure everyone here is well aware of her. Then I saw Midori made a passport traveler’s notebook. I began searching YouTube for videos about the passport size and I came across some videos by Doris Sanders. She was just starting to use a passport and Cocoa Daisy inserts. 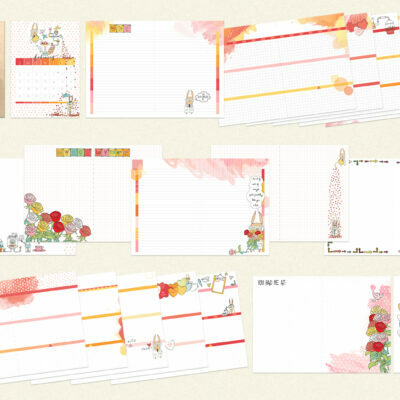 At this time the passport Cocoa Daisy inserts were only available as a digital download. This was my first trip down the printable road learning how to use the duplex feature of my printer. Here you can see the three planners I used this month: my Pocket rings, my Personal Rings and my B6 Slim traveler’s notebook. Since that year I have wandered down the traveler’s notebook rabbit hole and have explored everything. My first Cocoa Daisy subscription was the standard dori. This was due to me not really knowing how the subscriptions worked. But at that time I wasn’t really using any stickers or other things. All I used were my Coleto pens, Muji pens, and some Pilot Frixion pens and highlighters. 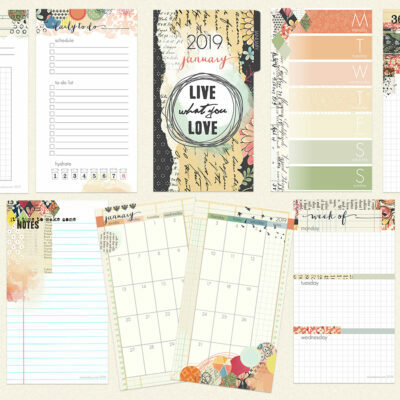 I eventually got into a subscription for the mini dori and planner kit and have been getting some sort of kit for almost two years, missing just a month here or there. 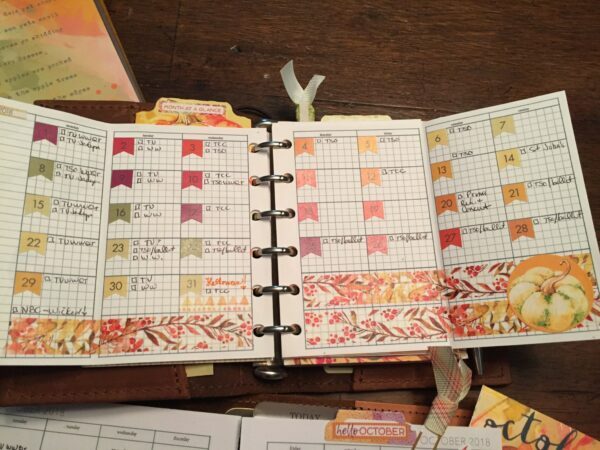 Something I did this month was use some of the great paper that Cocoa Daisy sends us in their kits to make insert dividers. 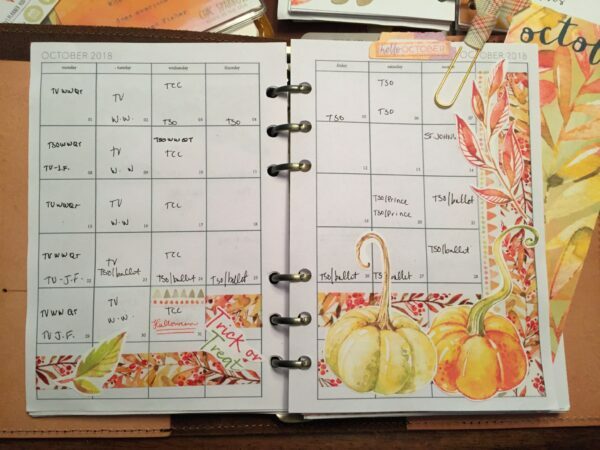 These added so much color to my planner that it always made it a joy to open and see all the pretty fall colors. When I got my first kit I was so excited. 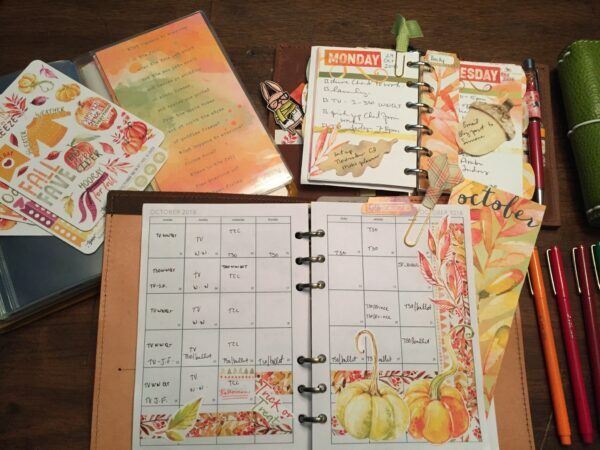 I knew many of the people that follow me on YouTube didn’t know all of the wonderful planner and decorating items that come monthly in the Cocoa Daisy Planner kit. So I decided to film an unboxing of all the goodies that are included in the box. These videos have become something that people love to see. I love sharing with others so they can see how I do things and so they can share how they do things. It’s so nice that there is a platform where we can all learn from each other to make our days more creative and make sure we get where we need to be at the right time on the right day. My Cocoa Daisy items were my go to this month. So functional and decorative. Wow, I am so shocked that we are at the end of October. This month seemed to fly by so quickly. First I want to thank everyone at Coco Daisy, thank you for allowing me to be part of the team for a month. October was a month of experimentation and trying new things. I spent much of the month in rings. Yes you read that correctly rings. I have been using a pocket ring planner for the past three months. There are so many things that I love about a ring system, one of them being if I mess up a page I can print another and easily fix a mistake. I tried this month Pocket rings, Personal rings, and even used a B6 Slim as a journal for my writing and my art. 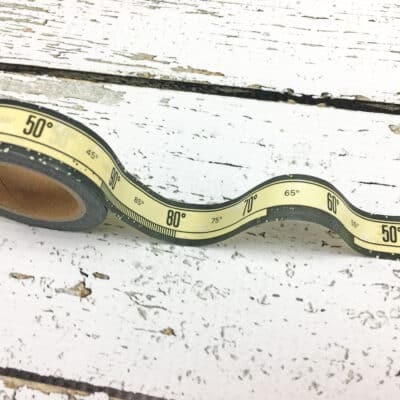 Something that I always do is make sure that I have a selection of the washi tape along with a few others to add to my planner and my journal.